When you’re out camping, you want to enjoy your relaxing time. So if you don’t feel like spending a lot of time or effort cooking dinner, we’ve got a couple of easy camping meals. As the title says, they are simple to create and absolutely delicious. Lay out the tortillas over a clean table and start by spreading the salsa out on the tortillas. Add the onion and the black beans on top. Finish off with the grated cheese. Fold the tortillas in half and wrap in tin foil. Put them on the barbecue or in a frying pan and grill for 10 minutes or until cheese is melted. You can choose to either leave it on longer to get a nice crust or take it off when the cheese is melted to have nice and soft tortillas. This is a perfect easy barbecue dinner but if you don’t have a barbecue with you this is also possible to make in a frying pan. 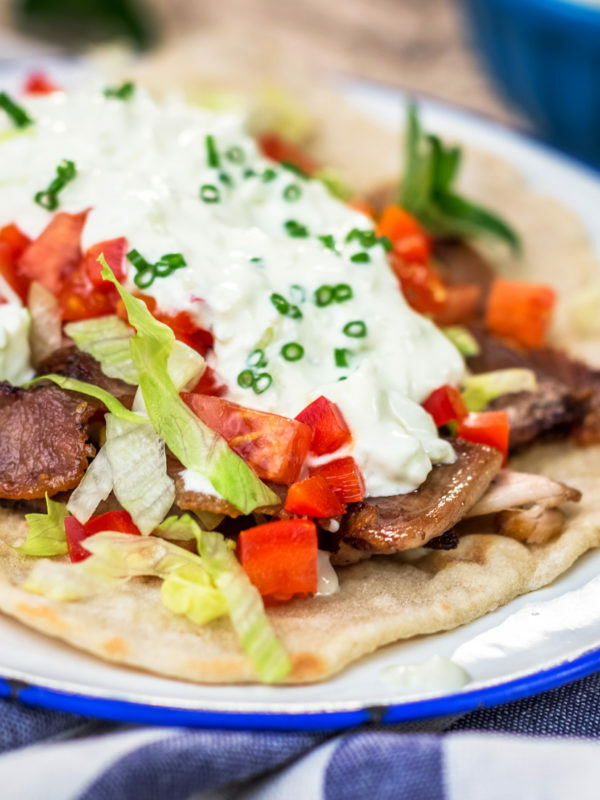 With the fresh taste of the tzatziki and the marinated beef, this is the perfect summer evening dinner. Add the seasoning together with the beef strips in two tablespoons of oil and let it marinade for 10 minutes. Cut the onion and the capsicum into rings if you use a barbecue, otherwise slice into smaller pieces. Put the onion, capsicum and beef on the barbecue until the capsicums are blistered and blackened and the beef is brown and juicy. Put the pita bread on the grill for a couple of minutes until puffed and charred. 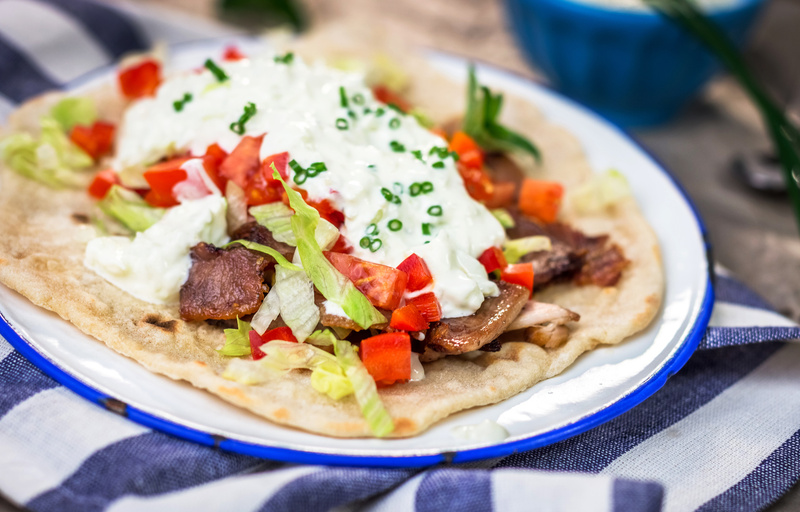 Fill the pita bread with the beef, vegetables, the iceberg slaw and put the tzatziki on top. Heat oil in a pot and when oil is hot, add the chicken. Leave the chicken until brown on both sides. Take the chicken out of the pot. If needed, add some oil to the pot and fry the onion. Add the capsicums and fry for 2 minutes. Add the seasoning and a bit of salt and pepper and stir. Pour the milk into the pot, add the pasta and bring to boil. Stir occasionally and let it simmer for 8-10 minutes on a low fire. 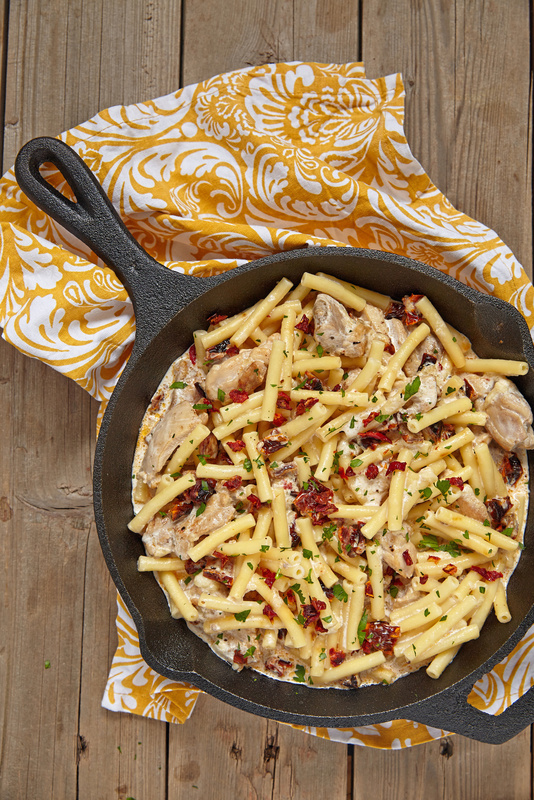 Once pasta is al dente, add cheese and chicken and keep stirring until cheese is melted and you have a good creamy sauce. Variation tip: instead of the Mexican seasoning, use Italian spices. Add some sun-dried tomatoes in the end instead of the capsicums.